HerbStrong CBD Review | The 2019 Update! HerbStrong CBD is one of the most popular brands out there for athletes, fitness fanatics, and more specifically, the Crossfit community. 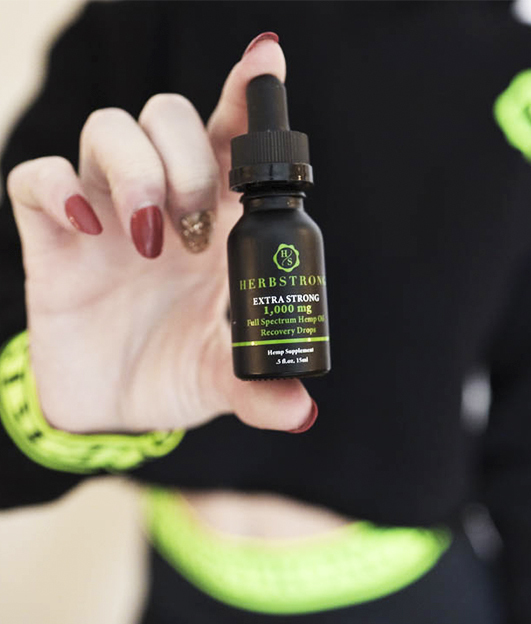 HerbStrong CBD oil reviews aren’t hard to come by these days, as the brand has more or less taken the Instagram world by storm. You know what we mean? All the pretty boys and girls out there are posing with their products and uploading the photos straight to Instagram. In fact, the youth of today seems to believe that these CBD products will be the next big thing in sports nutrition, because of their ability to help with things like muscle pain, anxiety, and other ailments that in reality we all suffer from. There’s no denying that the CBD market is going to explode, and HerbStrong seems like one of those companies that will be at the forefront of the movement. The label offers a wide range of products and gives exceptional customer service to its consumers, and the product range has been designed to balance health, help with recovery, and provide a long list of health benefits. In this all-encompassing HerbStrong CBD oil review, we are going to explore more about the brand, their selection of products, and whether or not they really can live up to all of the hype that they’ve created from themselves. Herbstrong CBD Oil: What Are They All About? HerbStrong CBD oil is mostly catered to athletes – the brand creates super potent full-spectrum products that have been designed to help you keep at the top of the game. It was founded by two young southern California men who were passionate about fitness, health, and innovation. After hearing about hemp oil and the potential that it has for the sports industry, they knew that they had to start a movement for more natural recovery and wanted to represent hemp in the light that it deserves. At this point, they started researching hemp in an effort to craft the best recovery tools for those people who work stressful jobs. Offering locally grown and reliable products at affordable prices, HerbStrong CBD has been making a lot of noise among the inner circle of CBD experts, and for a good reason — their products are high-quality, well-priced, and provide great value. 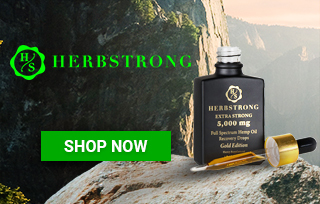 There is no denying that HerbStrong has locked its target market down to the tee; in the world of CBD today, many companies are discovering that this is what it takes to be a success in an industry where new companies are being created all the time. Furthermore, HerbStrong markets their CBD oil tinctures as “recovery drops,” as opposed to “CBD oil tinctures. This is because to them, that’s what it’s really all about – helping with athletic recovery. Not forgetting that the goal is to keep athletes at the top of their game. One of the great things about HerbStrong is that they have a very clear target market – the athletic community. This is wonderful because it shows a lot of focus and dedication to creating products that are especially helpful to a specific group of people. Many other brands have a large target market, and that leaves you wondering who exactly their products are for, or if they’re just trying to sell to anyone and everyone. Free shipping on orders over $100: US-based customers are entitled to free shipping when they spend more than $100. This is especially beneficial to regular customers since you could end up spending a fortune on shipping alone. 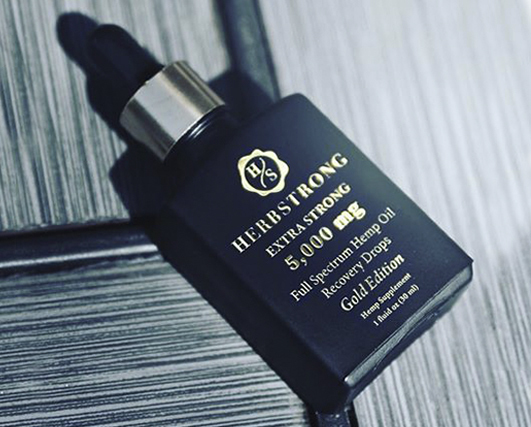 Full-spectrum products: HerbStrong is very much committed to the idea of full-spectrum oils. This means that the pure oil that is extracted from the hemp contains all the same compounds that are found in the original hemp plant. Unlike synthetic or isolated hemp extracts, full-spectrum products contain an array of cannabinoids. Customer service: HerbStrong is known for giving great customer service. On their website, they state that all email queries will be answered by the next business day. There is also a FAQ section that is super helpful. Veteran discount: Herbstrong offers a discount exclusively for veterans. There is a one-time discount code which is VET15, and thereafter your email address will be entered into their system and you can be added to the lifetime discount group – you will need to submit an ID. This is a great initiative and the first time we’ve seen this offered by any brand. Social media presence: While HerbStrong doesn’t have a large following on Facebook or Twitter, they are big on Instagram with over 75,000 followers. They post regularly on all platforms and offer plenty of discount promo codes and giveaways on Instagram. We were not overly impressed – and in fact, somewhat disappointed – with the HerbStrong packaging. We compare the CBD industry to cosmetics when it comes to this sort of thing, and packaging is a very important aspect. Unfortunately, this is where HerbStrong CBD realhasn’tn’t stepped up to the platform. They use a black theme with lime branding and accents. To fill the graphic space on their products they use some serif fonts and a type of ‘embossed’/family crest-style logo. In all honesty, the packaging is uninspired. We can only hope that they decide to relook their packaging in the near future. Of course, this is all a matter of preference, and there are people out there who may love it. Recovery drops: These recovery drops are the HerbStrong collection of full-spectrum hemp oil. They are available in strengths of 1000 mg, 3000 mg (Silver edition), and 5000 mg (Gold edition). They are infused in MCT oil. The 3000 mg and 5000 mg bottles are 30 ml, while the 1000 mg bottle is 15 ml. Recovery cream: There is only one topical sold by HerbStrong, and it’s the 1000 mg full-spectrum cream. It’s a soothing and relaxing cream that has been made for recovering injuries, muscles, pains, and cramps. There is approximately 20 mg of CBD per dime-sized amount. There are 50 servings per jar. Strong Paws pet drops: The Strong Paws drops for pets contain the highest quality hemp oil and are known for their ability to alleviate anxiety, inflammation, pain, and much more for our furry friends. These are available in strengths of 250 mg, 1000 mg, and 2000 mg.
Recovery drops: The 1000 mg recovery drops are sold for $65, 3000 mg will cost you $190, and 5000 mg costs $320. Recovery cream: This recovery cream is vegan-friendly, non-scented and ideal for sensitive skin. It’s sold for $65. Strong paws pet drops: The 250 mg drops cost $30, the 1000 mg drops are sold for $65, and you can buy the 2000 mg drops for $125. As one of the newer CBD companies on the market, HerbStrong has done a great job at making a reputable name for themselves in the industry. They’ve got a clear target market, and the goal is to make the best possible products for these people. Although they do market themselves to the fitness community, HerbStrong CBD oil for sale could be of benefit to anyone who’s looking to reduce stress or treat chronic pain. Of course, remember that CBD interacts with each individual differently, so keep your expectations open in terms of the benefits (or lack thereof) that you may experience personally. Hands down one of the best full-spectrum oils i have tried, the 1000mg potency is a great strength too for painful and achy muscles. Kayden from Ashburn just bough! Karina from Ashburn just bough! Reece from Ashburn just bough!